A pragmatic, very Dutch response to the reworking of a narrow terrace in Newtown, pushes the envelope by fashioning something bespoke from off-the-shelf architectural components. 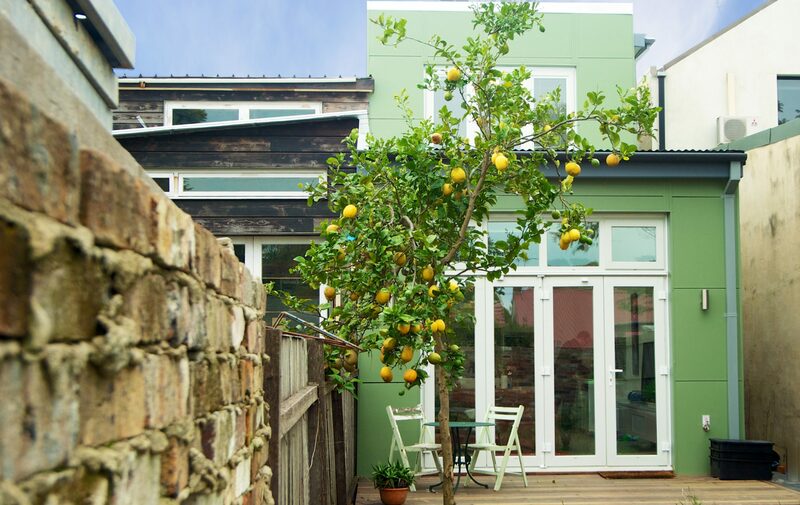 Our clients are truly devoted occupants of their Newtown House, seeing the dwelling as an ongoing case study in living sustainably and using technology to monitor everyday environmental performance. We met their enthusiastic brief by truly transforming the terrace, taking a ramshackle century old lean-to and creating a new open plan kitchen, living and dining area on the lower ground level, flowing out to a timber deck braced above the garden. For reasons of heritage and economy, the original frontage was retained, making an excellent platform for maximise the positive site attributes of orientation, depth and gradient in the redesign. These were exploited to allow an additional first floor bedroom zone, a split level ground floor living area, and outdoor entertaining area flowing easily into the rear garden. Grafted onto the rear from the original roof line, the two-storey addition pivots from a louvred timber stair connecting the three split levels, drawing natural light and ventilation deep into the interior. A new main bedroom was built into the attic space, along with a second bedroom and bathroom. Smart storage and material selection make the house comfortable, low maintenance and environment-friendly, from insulated pre-finished wall panelling and high-performance windows to the efficient laundry/wet room tucked under the stairs, to the water tank/bike store area neatly corralled outside in a service nook.